Clearly my maquette was not ready for prime time. I figured a 3D rendering would be a better way of presenting my hypothetical dual container. 3D rending, however, is outside of my usual wheelhouse. What software could I download and quickly learn just enough to do this one thing? 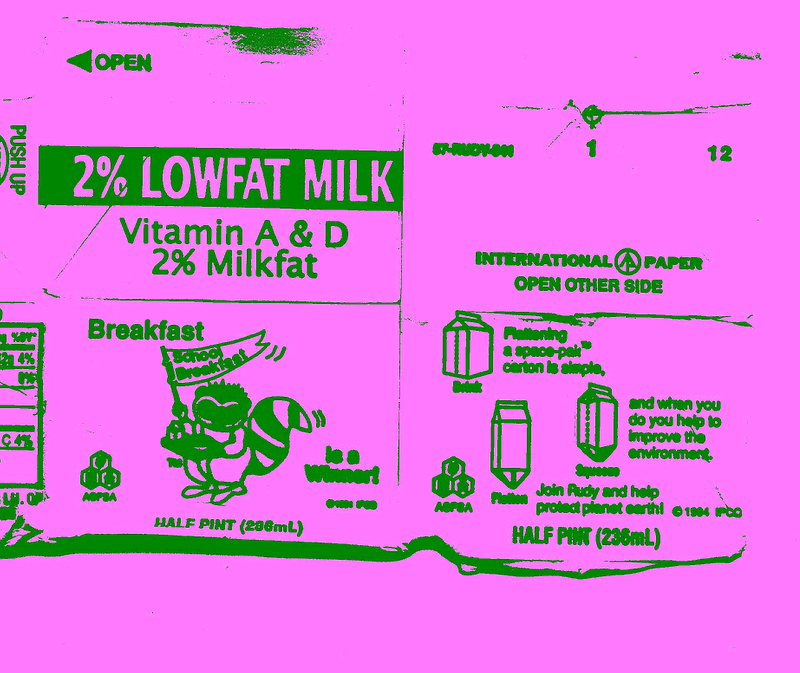 I relied heavily on Chris Wallace’s OpenSCAD code for his 2014 “Compound of 2 cubes.” He also wrote code for a “Compound of 3 cubes” which I am tempted to also attempt with milk cartons. I should mention, at this point, that more than two or three cubes can be made to symmetrically intersect. In addition to compounds of 2 or 3 cubes, there are also compounds of 4, 5, 6, 10, 12, 15, 20 & 21 cubes. Apparently. This is not the first time I’ve wrestled with intersecting cubes. A long time ago, (around 1985?) I attempted to make a polyhedral sculpture from record covers. I don’t think I ever took any photos of that fiasco. Thankfully. My record album sculpture was based on 5 intersecting cubes. Since each cube required 6 album covers, I had to cut up and reassemble 30 album covers. 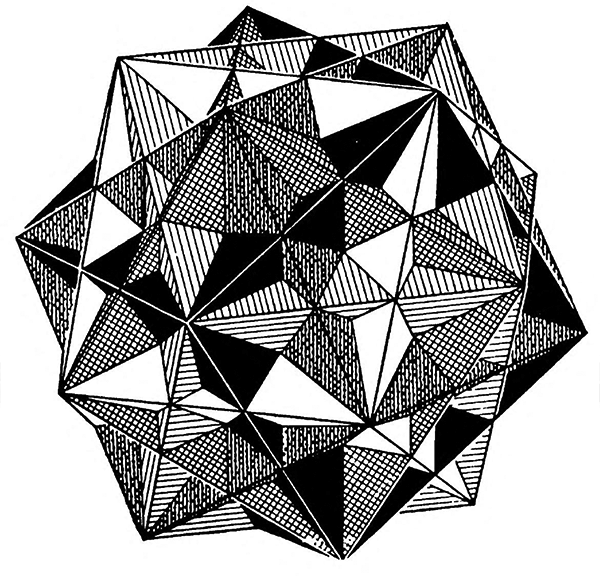 Into the crystalline, polyhedral shape you see below. I know someone somewhere is thinking: these are not intersecting milk cartons, because one of them is clearly a carton of orange juice. Fair point. For better color contrast between the cartons I decided that one of them ought to be orange. 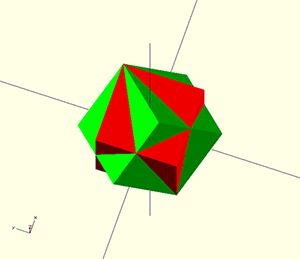 But this also makes our polyhedral carton oddly theoretical. After all, what sort of beverage is contained in the Venn diagram intersection of the two cartons? A curdled, citrus-flavored milk? Or is it more of a quantum superposition sort of beverage? Where you cannot know which liquid this package contains until you pour it into your (Schrödinger’s) cat’s bowl. Just kidding with that last quote. (I’m guessing that “carton model” was a misspelling or typo. Probably the author meant to write the most vivid Cartan Model.) 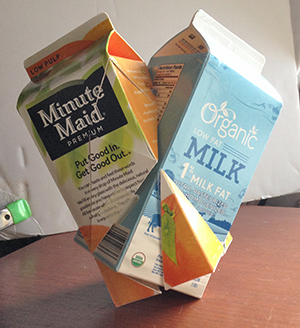 Milk cartons do not yet play a big role in quantum physics. Although, egg cartons do.